Action from the Nene Valley 10. Lincoln runner Tom Straw took the honours in the Nene Valley 10 road race at Bretton yesterday (December 7). The 23 year-old Lincoln Wellington member won in his first attempt at the distance in a fine 53:05. 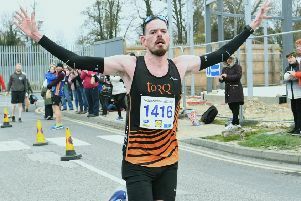 He was well ahead of Hermitage Harriers’ Matt Adcock (46), who clocked 53:59, with a similar gap back to third-placed Liam Smith (21) from Marshall Milton Keynes. he clocked 54:54. Host club Nene Valley Harriers supplied the ladies race winner in the shape of Over 45 cross-country international Philippa Taylor. The 47 year-old was first female home in a swift 1:01.38. Taylor’s personal best (PB) for the distance is 59:46. She has been struggling with an achilles injury all year, but still managed to beat her nearest competitor by a minute and a half. Second-placed Bedford Harrier Anna Folland (44) smashed her previous best time for the distance with a solid 1:03.07, an improvement of more than two minutes, while Martha Hall (38) from Garden City Runners was third in 1:04.27. The event attracted a competitive field of over 350 runners but the course records of 48:35 and 55:41 still stand.